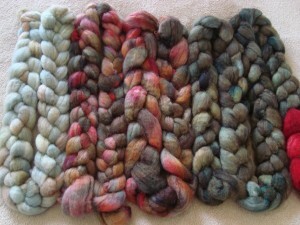 I posted last week about the samples I made in preparation for dyeing the February Cardinal roving based on Ellen’s picture. 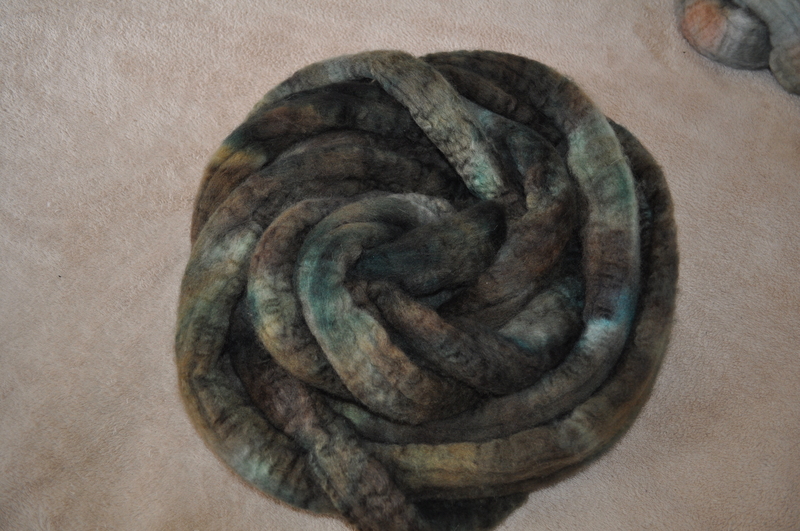 I also dyed the fiber, but I didn’t get it done in time for it to finish drying for pictures. We fixed that little problem this morning, so without further ado, here are the results of my little experiment. I dyed four different colorways, three that were aimed at actually reproducing the colors in the picture, and one that was just riffing off of the new colors on my sample cards. and the other has more dark. Put together, though, they’re hard to tell apart. This pair shows the problem with dyeing high-contrast colors right next to one another. Without some kind of gel thickener, the colors tend to bleed into one another. 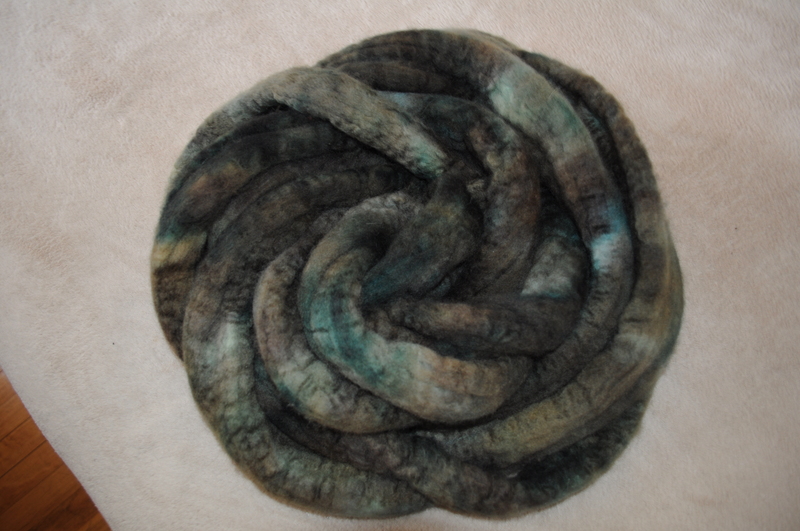 The dark dye also tends to take over the light regions, evening out the (purposefully uneven) dye application. It produces beautiful results, but it’s not really the representation of a dark forest with a brilliant flash of red that I was going for. 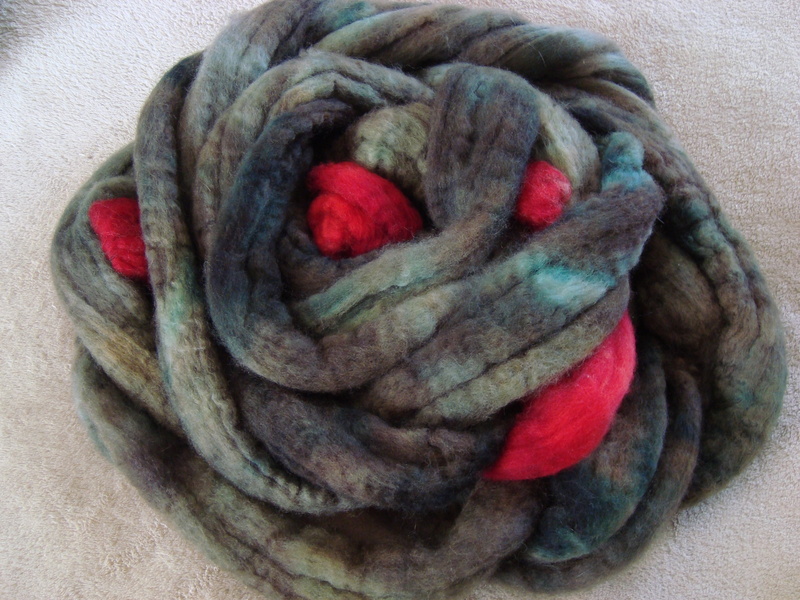 The next roving is my favorite of the bunch. It’s just a combination of very pale colors, all toned down with a tiny touch of gray. 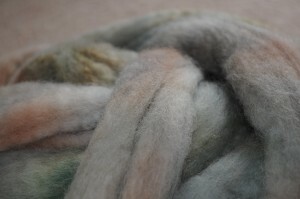 There’s a blue, and a green, and a brown that give the hint of color, and the three combine to make a very softly variegated fiber that stops just short of being pastel. I absolutely love it, especially in the shiny blue-faced leicester roving. 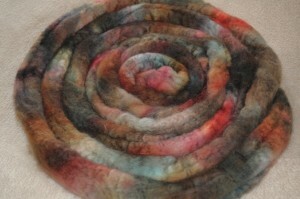 The last roving came the closest to what I wanted. That’s especially good, because I made 8 oz of this one (and only 4 oz for each of the others). 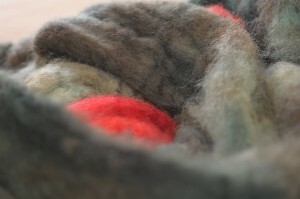 This time, I left out the red, and focused on the deep-dark greens. 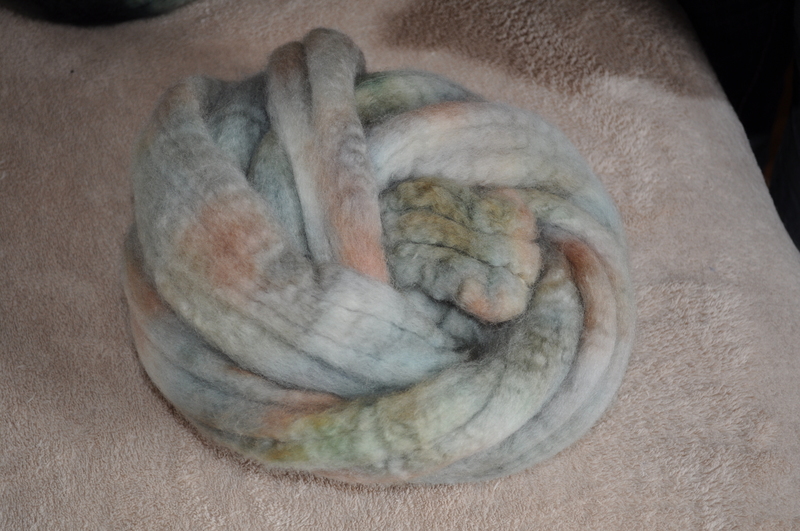 I tried to leave some pale spots, but again the dark colors bled in and mostly filled the space I’d left undyed. There are some spots that echo the trees in the foreground, but most of this roving is based in the shady greens in the background of the photo. Instead of putting red into this fiber directly, I kept a small piece aside and dyed it separately, to be added in at will during the spinning. This makes a bright, pure red for maximum contrast with the green, and without the problem of the two colors bleeding into brown. I think it would also be fun to spin this way, adding in a cardinal here and there on a whim, whenever it seems like there’s a little too much solid. It wouldn’t take much to have a forest full of them, peeking out from between the branches. In all, I think this was a pretty successful experiment. One roving came close to what I had envisioned, and the others took me in directions I wouldn’t have expected to make fiber that I really like. It added a few more colors to my sample cards and made a few more pieces for the shop. And best of all, it was fun to do. I definitely think we’ll be trying this again soon. I think the pastel is my favorite as well. There’s just something about those soft colors. It’s nice when experiments work out so well. I agree with the first one, not as much of a representation, but turned out lovely! I think your decision to make them separate sections of roving was probably the best. I am sure it will turn out beautiful! Suddenly I see red cocoons spun around the greens. 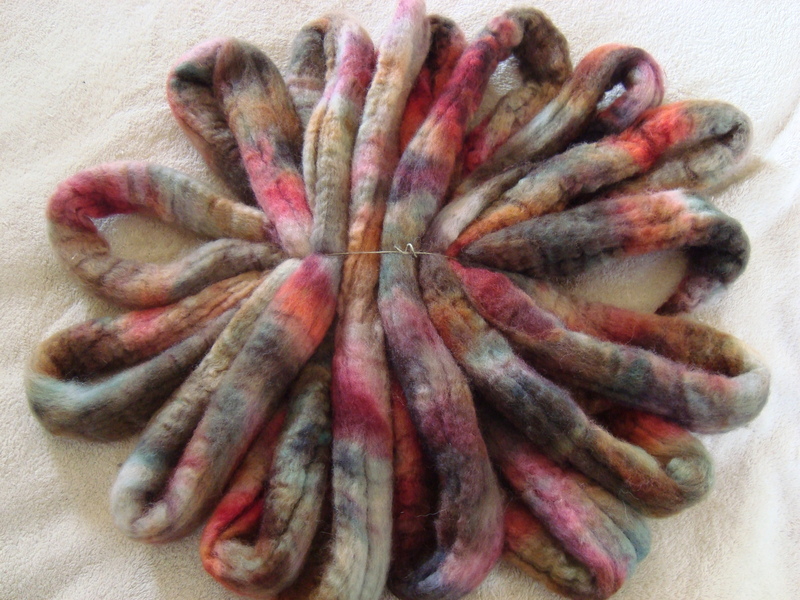 Great inspiration so dye that piece separately! Oh, gosh!! I love the way that last bit looks, with the red peeking out – how fun! And you’re right, BFL is just a stunning fiber, isn’t it? 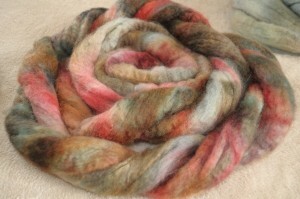 I always find myself with my hand on the BFL in a pile of other roving (and it’s fun to spin). I love them all! I did some dyeing Saturday and it was great fun – definitely plan to do more! DesigKnit is powered by	WordPress 4.8.9 . Page generated in 0.300 seconds using 38 queries.